European Parliament BUDG Committee Meeting: 2014 budget Presentation. 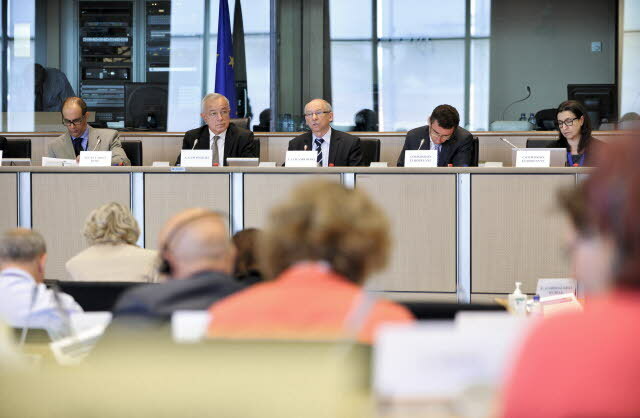 Alain Lamarousse, Budgets Committee chair (second from left), Janusz Lewandowski, Commissioner in charge of Financial Programming and Budget (third from left). (European Parliament Audiovisual Services, 26/6/2013). The much-advertised agreement between the European Parliament, the Council and the Commission on EU’s proper budgets for the next seven years seems to be more like wishful thinking rather than reality. Some days ago the Irish Presidency of the European Council issued a Press release saying that the EU Parliament agreed on the overall spending ceiling for the so-called Multiannual Financial Framework 2014-2020, containing the EU budgets of this period. Things do not seem however to be quite like that. There is reliable information that yesterday the President of the European Parliament, Martin Schulz sent a letter to the Irish Presidency of the Council telling them that the ‘outcome’ of the negotiations may very well be rejected by the vast majority of the European deputies. Mind you the President doesn’t refer to an ‘agreement’ but rather calls it an ‘outcome’. Probably the Irish didn’t understand well. Let’s take one thing at a time. At this point it must be noted that the European Council of the 27 leaders agreed last February on an overall €960 billion spending backstop for the European Union for the next seven years. Within days this proposal was rejected by the Parliament. After that tensed negotiations started between the Irish Presidency, the Parliament and the Commission aiming at the conclusion of a deal before the summer holidays. No EU budget can be approved and applied without the positive vote of the Parliament. Traditionally the Parliament on the one side wants to increase EU spending and the Council and the Commission on the other to cut it down. All along those past months on behalf of the Council the negotiations were conducted by the Irish Presidency represented by Eamon Gilmore, Irish Deputy Prime Minister and Minister for Foreign Affairs and Trade. On many occasions the Irish Presidency appeared to press hard on the Parliament to accept the will of the Council and agree on spending cuts. The Parliament negotiator resisted those pressures and finally last week the Irish Deputy Prime Minister announced that the Parliament agreed on the overall ceiling for the next seven EU budgets set at €960bn. The Parliamentarians demanded certain changes in order to accept the overall ceiling. Theoretically those demands were satisfied last week by the Council and the Commission and the final deal was struck with the Parliament. The problem now seems to be that the mood among the majority of the European deputies is against this ‘agreement’, which Schulz calls an ‘outcome’. Obviously the President of the Parliament with the above mentioned letter to the Irish Deputy Prime Minister wants to inform him and the Council over the negative mood prevailing in the legislative. “Seemingly the draft budget for 2014 is the first illustration of the reduction of the new multi-annual financial framework as desired by the Council. The so-called ‘Growth Pact’ is already falling apart in the first year, due to a greatly reduced budget,” said Budgets Committee chairman Alain Lamassoure (EPP, FR). Sources in the Parliament insist that the 2014 budget as proposed by the Commission yesterday is 6% lower than this year. “As the Union risks falling into recession, the annual budget will be cut by 8 billion euros. Research spending as well as regional funds are to be amputated by 13.5% and support for SMEs will be cut by 20%”, Lamassoure added. As things stand now the EU budget not only for 2014 but for the entire seven-year period 2014-2020 is in the air. Late last night the Irish Presidency sounded the alarm and the Irish Prime Minister and his Deputy, Taoiseach and Tánaiste as the Presidency’s Press service insists to call them in their own language, traveled to Brussels to meet the EU Parliament President Martin Schulz. It seems that finally the Irish understood that it’s not that simple to negotiate with the European Parliament. Probably the Irish have messed it up.